A public meeting is being held to discuss the uncertain future of a school where the children have recorded a protest song. 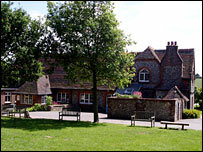 Selsted Church of England Primary, in south-east Kent, is one of 12 schools earmarked for closure because of falling pupil numbers in the county. The Save Selsted Action Group is behind the protest song and a campaign DVD. The meeting for concerned parents to question members of the county council was scheduled for Wednesday evening. The Kent Primary Strategy has been drafted to deal with more than 14,000 empty school places across the county. The council said something must be done because each surplus place costs £250 a year to maintain. Selsted is the only school in the Shepway district being put forward for closure. The council was holding Wednesday's meeting as part of a public consultation period which is due to end on 14 July. The proposed closure of Selsted School still has to go back before Kent's School Organisation Advisory Board (SOAB) in September. The action group is encouraging people to raise their concerns with SOAB members. Spokesman Costas Sotiriou said: "The children don't want to go anywhere, they've bonded with their friends." The protest song has lyrics written by a parent and vocals courtesy of all 70 pupils. One of the lines is: "Don't close our school, it's been here for many years, my mum and dad both came here too, its closure will mean tears."